Drunk driving enforcement in this country has become a racket. It’s not about safety, it’s about money. Actually, the drive over the past two decades to lower the legal limit of alcohol for drivers has likely made traffic less safe. It has undoubtedly, though, put millions of dollars into the coffers of various jurisdictions via fines and vehicle confiscation. Additional millions have lined the pockets of police officers via overtime pay to appear in court and to man sobriety checkpoints. The cynic in me says that as long as police officers and municipalities see drinking drivers as cash cows and hide behind the fig leaf of “traffic safety”, arbitrary standards based on BAC will continue even though they may be counterproductive. In fact, after there was a national push by Mothers Against Drunk Driving to lower the legal BAC limits nationally from 0.10% to 0.08%, backed up by federal pressure on states, alcohol-related traffic fatalities went up in 2000, after 20 straight years of going down. That increase shouldn’t have been surprising. The push for a de facto national limit of 0.08% came after a 1995 NHTSA study already showed that some states that lowered the BAC limits were less safe than before. Those lower limits may have meant a windfall of revenue to jurisdictions and individual police officers, but they didn’t necessarily make us any safer. They may have led to more booze related driving injuries and deaths. How do lower BAC limits mean more alcohol related accidents? Because those lower BAC limits in most cases led to the institution of sobriety check lanes, legal in all but 9 states. Assuming that the purpose of those checkpoints is genuinely to catch drinking drivers and not just put money into municipal coffers and cops’ pockets, I think it stands to reason that the rationale is to catch those drinking drivers that conventional on the road enforcement wasn’t catching. The idea, I suppose, was that if you check every driver, you’ll find the ones who have been drinking but aren’t impaired enough to catch attention from police or other drivers. In other words, the purpose of the check lanes is to catch drivers who aren’t driving dangerously, except for the fact that they have a particular amount of alcohol in their system. Most drivers that have a BAC of between 0.08 and 0.10 percent are not driving badly enough to catch attention from police. They may be buzzed but they aren’t swerving, speeding badly, or failing to keeping up with traffic. When police are busy at a sobriety roadblock or setting up surveillance near restaurants and bars, they are not out on the roads trying to find more dangerously impaired drivers. Yes, they get some folks on the cusp of legal intoxication, generating lots of revenue in the process, but they don’t make the roads safer. A nighttime sobriety checkpoint might take more than 20 police officers away from tasks that actually make our roads safer. Only nine states don’t allow suspicionless sobriety checkpoints. 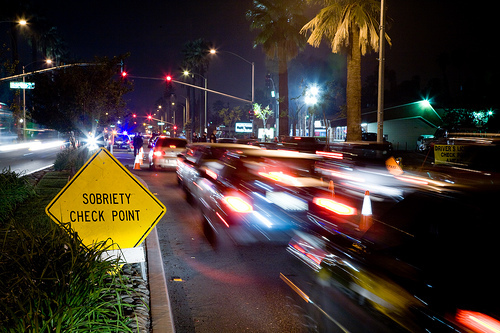 Using 2009 data collected by the University of California at Berkeley, California Watch showed that 1,600 sobriety checkpoints yielded 3,200 DWI arrests. An typical checkpoint would yield only two or three drunk driving arrests. Most of the checkpoint DWI arrests involved people close to the legal limit, rather than at high levels of intoxication. When you consider how many hundreds of drivers get stopped at each of those checkpoints, it hardly seems productive to catch a tiny number of drivers that are over the legal limit but may or may not be dangerously impaired, while at the same time seriously impaired drivers go unstopped because so much police manpower is devoted to sobriety checkpoints. Of course there are other serious crimes besides seriously impaired driving that go unchecked while the local PD or state police are busy pulling people over at checkpoints. Well, that is, it hardly seems “productive” until you see the bottom line for the municipalities and the cops personally. Drunk driving and sobriety checkpoints are big business. To begin with, a single DUI conviction can mean thousands of dollars of revenue for the jurisdiction that issued the citation. That’s only the tip of the iceberg, though. While sobriety checkpoints don’t catch many seriously drunk drivers, they do nab folks for equipment infractions or other sorts of minor crimes and they end up generating a huge amount of revenue for those municipalities and police officers that do use checkpoints. That same California Watch story revealed that those 1,600 police checkpoints may have yielded just 3,200 arrests for DWI, but they resulted in $40 million in fines, plus $30 million in overtime pay for cops and a staggering 24,000 vehicle confiscations. Assuming that there are towing and storage fees involved in those confiscations, add on even more millions that are extracted from drivers, not to mention those vehicles that end up being part of a “civil” or criminal forfeiture case. Thirty million dollars in the pockets of cops, $40 million in revenue for their employers, over twenty thousand cars confiscated, all without much proof that seriously impaired driver have been gotten off of the roads. In the real world we call that a racket. I’ve been a California Highway Patrolman for 23 years. Lowering the BAC to .08% was a good law. Almost everyone has some impairment at .08%. Have you ever heard of the term “lightweight”? Many people are under the influence at .05%. Many, but not all, therefore; the state of California makes no presumption on blood alcohol concentrations between .05 and .07%. As for DUI checkpoints not being an efficient enforcement method: On an average night on patrol I may stop between five and twenty people. If I strike pay dirt early, I’ll make fewer contacts. At a DUI checkpoint, a crew of five highway patrolmen may contact a thousand drivers in a night. We may not make many arrests, but there are 1000 drivers, and their passengers, who are more aware of DUI enforcement. Look at it as an investment. I can’t speak for other agencies, but a checkpoint is not a cash cow for the CHP. The California Highway Patrol was formed specifically as a non-revenue generating agency. None of the fine money we generate goes into our budget. We are funded exclusively from registration fees (there are some minor exceptions, but they are less than pennies on the dollar). A for the record, we don’t have quotas. BWG, do you get paid overtime for manning sobriety checkpoints. Do you get paid overtime for court appearances? DUI checkpoints are often funded with federal grants so in those occasions, yes, they are on overtime. Other times they are on straight time. Court appearances on my days off or if I’m working nights (and court is during the day) are paid overtime. Court during my regular work days are straight time. I’m sure you believe everything you’ve said. You probably couldn’t do your job if you didn’t. But to anyone not in your position, it’s laughable. The current system doesn’t serve the public interest because it not only doesn’t get drunks off the road, it isn’t even intended to do that. Instead it criminalizes innocent behavior and makes lots of money for cities and counties, police agencies, lawyers, insurance companies, etc. I know of what I speak. I used to make pretty good money myself off this system. I saw it from the inside. Thankfully, I’m retired now. At least I know that I made my money fighting for justice and trying, unsuccessfully, to change this vicious system that takes good people and turns their lives upside down, all without doing one thing about drunk driving. Those innocents, and the those who are killed by truly impaired drivers or lose loved ones to drivers impaired by alcohol or drugs, are the victims of this diabolical scheme. I don’t blame you, BWG, you’re just doing your job. But your job should be changed. The laws should be changed so you could spend your time finding impaired drivers instead of politically incorrect drivers. 1) Re “the state of California makes no presumption”, what is it about “presumed (!) INNOCENT until found guilty” (NOT “presumed guilty to avoid inequality between targets”) that you don’t (or that the state of California doesn’t) understand? 2) Moreover, BWG takes as a given the meaning of Impairment as driving totally irresponsibly, and recklessly, and putting others’ lives (and/or one’s own) at risk (something Ronnie Schreiber’s article just debunked); even though the howls of the Left will, again, erupt here, there must certainly be a difference between driving “impaired” — or driving unimpaired, for that matter — through, say, busy city streets, along a suburb road, or on the freeway. Here, we get to the heart of the second matter. Any place on the planet you go to — you will find that freeways are the safest roads around: safer than city streets, suburb roads, country lanes. And yet this is… the main place where the police set their sobriety roadblocks, their radars, and their speed traps. I don’t think Mr. Schreiber debunked anything. I don’t know what’s in the 1995 NHTSA study, but I know what’s not in it – a direct and provable link between reduced BAC laws and highway safety. Not every impaired driver drives poorly when I’m behind them. A drunk can often obey the traffic laws from the bar to the driveway on a routine basis. But they are still a danger. They don’t crash every time they drive, DUI laws were written to stop impaired drivers BEFORE they crash. Mr. Schreiber’s article points out that DUI checkpoints are inefficient, so how can they be part of a racket? Oh wait, it’s a government run program, what does efficiency have to do with anything? Never mind. Generally speaking, crime doesn’t pay, for criminals or for the government. Yes, the government generates some revenue from DWI fines. It also generates income from most other low level crimes through fines as well. This does not make DWIs a cash cow for police departments. Depending on how the local government and courts are set up, the police may never actually see that money from fines. For example, in Texas DWIs (at least the 1st and 2nd offenses) are handled in county courts, so fines are paid to the county courts. City police departments do not see any of those funds. Also in Texas, 3rd offense DWIs are felonies. Anyone associated with criminal law knows that felony prosecutions are expensive for all parties involved. In places where DWIs are lesser misdemeanors and are handled in municipal courts, funds might go to the police. In my experience, police see speeding tickets as money makers. But as the penalties for DWIs increase, so do the costs of prosecution and punishment. Police usually view DWI roadblocks as a publicity move to show that they are protecting the public, even if their methods are ineffective. But DWI roadblocks, while ineffective and IMHO unconstitutional, are not per se cash cows for police departments.